This 1-day workshop for beginning-intermediate bakers is a thorough training in high hydration sourdoughs. We’ll spend the day in a hands-on examination of all the critical steps in traditional bread-making process. We’ll also discuss the science of sourdough culture, the history of bread-making, and sourdough starter management techniques. Attendees will leave with their own starter, pizza dough, and freshly baked bread, as well as instructions tailored to home baking. 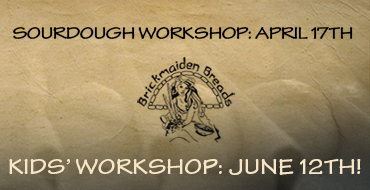 Taught by David Gumbiner, Brickmaiden baker (and long-time home baker). Light lunch included. Kid’s Bread Workshop! Sunday, June 12th 11am-3pm. This will be a fun, hands on workshop in which we will explore the physical properties of gluten, weigh out and hand mix our own sourdough, and bake off fresh loaves of bread to take home. We’ll also observe the fermentation process of sourdough culture. Children from 8-12 years old are welcome. Snacks will be provided.